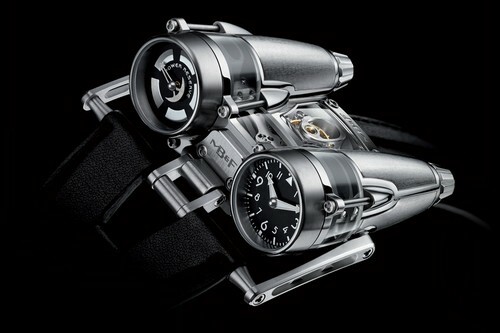 This piece of technology is made by MB&F, watchmakers reputed for their unique design. The 311 component aviation inspired watch is based around the complex HM4 engine and has dual dials. One displays time and the other one shows how much power is left in the timepiece. While it is made out of Grade 5 Titanium and sapphire body, every line and curve is a poetic harmony. The three dimensional Horological Engine used in this piece art is a marvelous creation by MB&F. It comes with a manual winding, with two mainspring barrels in parallel which reserves the power for 72 hours. The balance frequency of this watch is 21,600bph/3Hz. Not only that, this high tech watch also consists of 50 jewels inside.